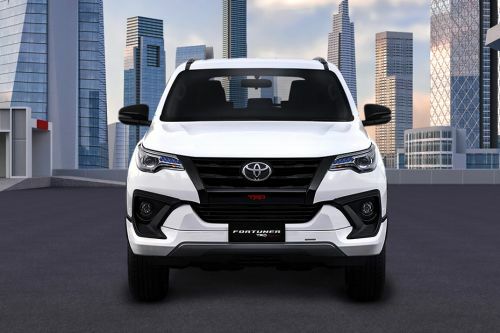 The Toyota Fortuner might be the entry-level full-size SUV from Toyota, but it still has the charisma and stance derived from its bigger siblings like the Prado and LC200. The fact that it is based on one of the most reliable vehicles produced ever, the Hilux pickup, the Fortuner in all these years, has mightily impressed with its reliability and practicality. In this new current generation model, the Fortuner has ditched its old school boxy silhouette for a swankier and sleeker form. Even the interiors have been spruced up with many new features and soft touch elements to make the overall cabin feel more spacious and up-to-date. Talking about the engine options, the Fortuner gets a 2.7-litre four-cylinder petrol engine which produces a power output of 165 PS and torque output of 245 Nm. Also available as an option is a 2.4-litre diesel engine, which churns out 148 PS of power and 400 Nm of torque. Have a question on Fortuner? Fortuner is available in 6 different colors - Silver Metallic, Medium Silver Metallic, Attitude Black, Super White II, Phantom Brown Metallic and Avant Garde Bronze Metallic. Watch latest video reviews of Toyota Fortuner to know about its interiors, exteriors, performance, mileage and more. Since its production started in the year 2005, this roaring SUV from Toyota has gained a huge attraction in the southern part of Asia. Built on the platform of its kin Toyota Hilux pickup truck, the new faclifted version of Fortuner is all set to roll on the Malaysian roads. Awarded as the Innovative International Multi-purpose Vehicle in 2012, this vehicle is being marketed in more than a dozen nations. With refined new masculine look, this four wheel drive SUV is available here in four variants- 2.7V TRD Sportivo, 2.7V, 2.5G TRD Sportivo and 2.5G. Generous space of the Fortuner accommodates a total of 7 occupants at a time. 6-way power adjustable leather tailored black color seats offers state-of-the-art comfort during long travels. Automatic air conditioning with rear AC vents allow you to breathe fresh breeze throughout the journey. 2-din audio system with a combination of 6 speakers avails fine quality acoustics. You also have the option to upgrade the infotainment system to a 7 inch touch screen with GPS, WiFi and Internet browser. MP3 player with AUX-Jack allows you to plug in any external devices and switch to your choice of playlists. 4-spoke multi-function steering wheel is equipped with controls of the Multi-Information Display, that displays a couple of decent informations like: outside temperature, fuel consumptions, compass, etc. Boot space of 296 litres can be further increased by folding the second and third row seats. Combination of smooth curves with masculinity in the sculpted hood throws a bold impression to the dynamic silhouette of the SUV and the chrome embossed reverse-trapezoidal radiator grille allows ample air to be transported to the engine bay. Dark Bezel projector lamps illuminates the dark areas nicely, providing for confident driving. Newly added LED Daytime running lights adds elegance to the car. TRD Sportivo offers a package of aerokit comprising of front and rear bumper spoilers with TRD identification stripes. The giant size of the SUV measures 4705mm X 1840mm X 1850mm (LXWXH) which makes for a dominant road presence. Dark grey toned 17 inch alloy wheels are standard in the SUV and accommodate a tyre specification of 265/65 R17. The gigantic hood of the Fortuner accommodates an in-line 4 cylinder engine, with the option of two engines a 2.7-litre petrol engine and a 2.5-litre diesel engine. The basic 2.7V and its TRD Sportivo variant churns out 160 PS at 5200 rpm with an overall torque of 241 Nm at 3800 rpm. On the other hand the diesel 2.5G and its Sportivo variant knocks out 144 PS at 3400 rpm with a maximum torque of 343 Nm between 1600 rpm to 2800 rpm. Common Rail injection with Intercooler VNT installed in the 2.5-litre diesel engine offers a quieter and responsive performance, while offering a decent mileage of 13 km/l. Braking system with ventilated disc brakes at front and drum brakes at rear are installed with Anti lock braking system, that prevents the locking of wheels during rapid braking. Combination of double wishbone and 4-link suspension with coil spring and lateral rod offers stable and comfortable rides even on nasty off-road tracks. High-tensile impact absorbing body of the Fortuner is specially designed to encounter harsh frontal collision, thus preventing the risk of severe injuries. Collapsible steering column with dual SRS air bags equipped in the car ensures maximum safety during frontal crash. ISOFIX child safety mounting offers good child seat harnessing. Toyota vehicle security system offers decent safety against vehicle theft. Being a tough contender under the SUV segment, the new facelifted Fortuner has a refreshed character, both in terms of performance as well as aesthetics. Off-roading capability of the SUV is also praiseworthy but a price crop would have made this SUV the most preferred one. What are the Safety Features Available in Toyota Fortuner?